It appears that there is a chance for strong to severe storms later today. The Storm Prediction Center has placed all of southeast Missouri, southern Illinois, western Kentucky, northwest Tennessee, and northeast Arkansas in a "Slight Risk" area in their latest Day 1 Outlook. The outlook is valid from now through 7am Monday. According to the SPC, scattered thunderstorms will be possible later this afternoon. Large hail and localized damaging winds will be the main threats from any storms that fire. 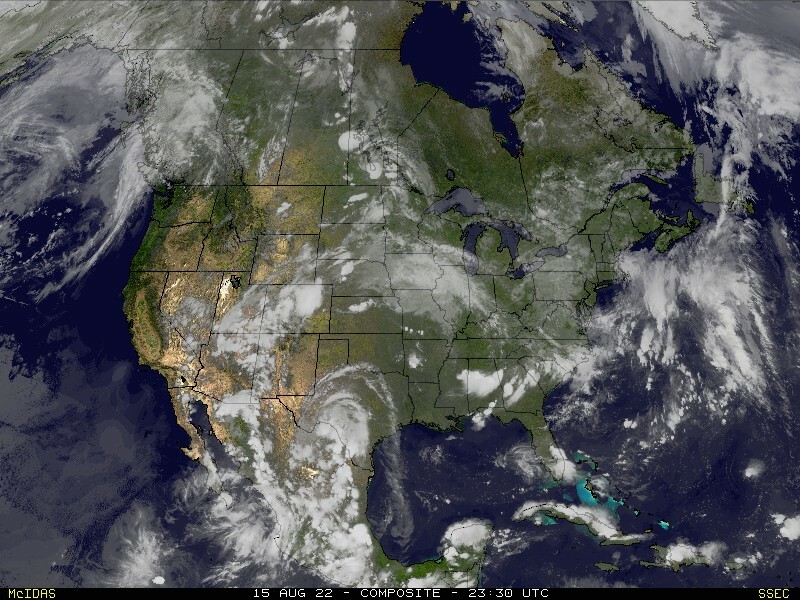 Yesterday I talked about needing to get the atmosphere ready for destabilization. The southerly winds would need to draw up moisture from the south to get fuel in the fuel tank. The wind did the job. Here is a look at observations from airports around the region at 10am CT.
You can see dew points (the numbers in green), the measure of moisture in the air, have climbed from yesterday's 30's to the 50's and even 60 in Poplar Bluff, Mo. I think this is ample to support thunderstorms. We will need some sunshine to help destabilize things. Looking a the latest satellite imagery this could be one of the big questions. Last night the models were hinting at sunshine by late morning and early afternoon. Hi-res models this morning are also indicating we should be seeing sunshine by late morning. 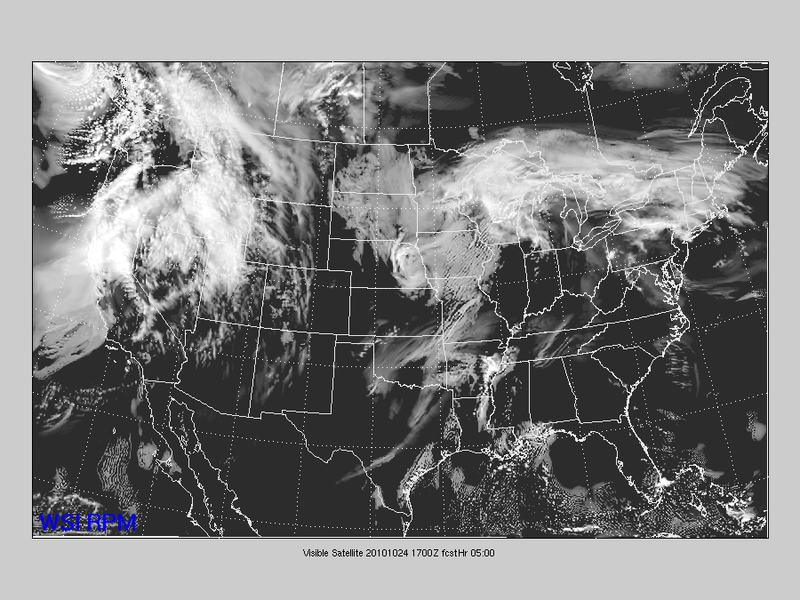 Here is a look at a hi-res 4km model's depiction of what the satellite imagery will look like at noon. 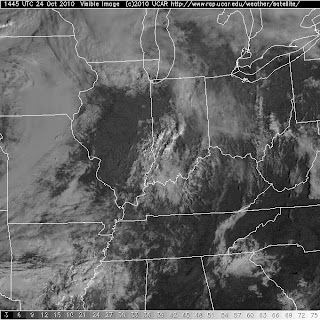 Unfortunately, after looking at the real time satellite image from above, I think the models aren't handling the cloud cover well. This could be the big inhibitor of thunderstorms later today. 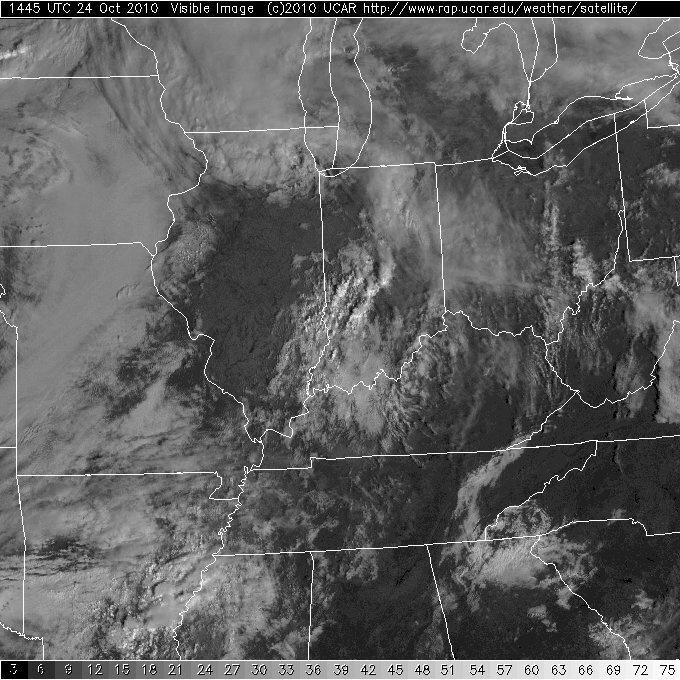 However, if we do get sunshine breaking out we could get some popping up in the afternoon. The last run of our hi-resolution Precisioncast model (the one we show on television) is keeping the rain north of the area and south of the area. In fact, it develops a line of thunderstorms across central and southern Arkansas and moves them east towards Memphis late tonight. We shall see how things pan out. I still think the best chance for storms, and maybe some severe storms, will happen early Tuesday morning. For more on Tuesday, watch the video post from yesterday. My thoughts haven't changed. About 11am in Herrin and Dew Points reaching 52F. Sun has been in and out, mostly out all morning. Winds gusty around 10mph. Temps are a lovely 71 degrees. Hope the clouds can hold and we see some storms. Rain is defiantly needed, but storms are wanted, at least by us.